The result [of increasing student loans] is over $800 billion in outstanding student debt, over 30 percent of it securitized, and the federal government directly or indirectly on the hook for almost all of it. Yowch. Of particular interest, if you happen to be or know someone with student debts or probable future student debts, is Harris’s overview of how higher ed has shifted to a corporate-ized model over the last forty years or so. Tuition costs have exploded, which means students take on more debt–but there’s less and less assurance that when they graduate they’ll have a job at all, much less a job allowing them to pay off $50,000 while also establishing a household and a life. At the same time, high-cost university courses are more likely than ever to be taught by adjuncts or graduate students, who are paid little and have no job security. And while the proportion of tenure-track teaching faculty has dwindled, the number of managers has skyrocketed in both relative and absolute terms. If current trends continue, the Department of Education estimates that by 2014 there will be more administrators than instructors at American four-year nonprofit colleges. A bigger administration also consumes a larger portion of available funds, so it’s unsurprising that budget shares for instruction and student services have dipped over the past fifteen years. In today’s Oregonian (our newspaper around these parts) was a piece about a bipartisan state bill (HB 2732) that was just passed, requiring high school students to apply to university, the military, or an apprenticeship program before they can receive their high school diploma. There’s no requirement that people actually follow through (although an application to enlist in the military seems potentially binding to me) but the bill is on its way to the Senate. No word on whether the state will put any more money into actually funding degrees for those students who are accepted. Wow…Miller Library at McPherson College has really raised the bar for interesting, lighthearted, student-friendly collateral. 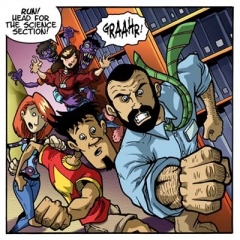 Their Library of the Living Dead comic is irreverent and snappy and well-drawn, thanks to creators Matt Upson and Mike Hall. There’s a great interview with them by Lizz Zitron over at The Outreach Librarian. I’m tagging this one “infographics,” just for the heck of it.